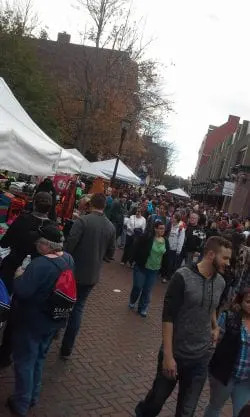 The reason so many people come to Salem in October is the energetic atmosphere created by…so many people. Part of the festivity is chatting with fellow revelers and soaking up the atmosphere. A few people who aren’t in the right frame of mind might grumble about the lines, crowds and traffic. Prepare yourself with information, and embrace it all as part of the fun. Check out Destination Salem’s Haunted Happenings online visitors’ brochure to help plan your trip. You’ll find a helpful walking map of the downtown and waterfront area listing major attractions, shopping, restaurants and activities. It also lists parking options and road closures (for parades) where applicable. You can pick up the print version of the Destination Salem Guide & Map once you’re here at the Salem Witch Museum, at the National Park Visitor Center, or many other places throughout the city. 2. Arrive as early as possible. The Salem Witch Museum opens every day at 10:00am. The earlier you arrive to purchase tickets, the more likely your preferred tour time will be available. If you’re traveling by car, early birds get the best parking spaces. 3. Dress in costume, but leave weapons – real or fake – at home. Don’t ruin your night by having your real-looking costume weapon confiscated. Most establishments have rules prohibiting anything that looks like a weapon and ask that you remove your masks while on the premises. It is possible – even likely as we near Halloween – for certain presentation times to be sold out. Be prepared to opt for an earlier or later tour time. Our presentations begin promptly at :00 and :30 of each hour and last approximately one hour. 5. Anticipate lines or wait-times. Just about everywhere in downtown Salem will be hopping with celebrators the nearer we get to Halloween. Pack snacks and diversions for the kiddies if necessary; for grown-ups the atmosphere is a free show in itself. And, if there isn’t a line or wait, just be pleasantly surprised! The closer we get to Halloween the busier traffic into Salem gets. Get in the mood by tuning in to Syrius radio’s Halloween station or listen to the audiobook of Ray Bradbury’s the Halloween Tree. Directions can be downloaded here, and it’s always possible to map out alternate routes into Salem, ie. Route 1A, Route 107, Route 127.